As most of our applications for tickets for Olympics events were unsuccessful, David applied early for tickets to the Paralympics. We went to an athletic event in the Stadium (David Weir won gold for 1500m), swimming in the Aquatic Centre (NZ girl Sophie Pascoe won gold), sitting volleyball at the Excel centre (Russia beat team GB) and rowing on Dorney Lake (team GB coxed four won gold). Everywhere the competition was intense, the crowd excited and happy and the settings, apart from the functional ExCeL centre, most attractive. The Olympic Park was a pleasure to visit and the much predicted hassle never eventuated. A few photos are below. 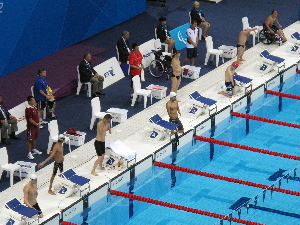 For many more of the Paralympics see David's photos on Geograph. David Weir of Team GB leads the Paralympics 1500 metre T54 final wheelchair race - he won gold in this event and three others. Blind runners with guides. In most pairs the guides are on the opposite step to the athletes so their hands move together, itself an achievement at this speed, requiring many hours of training together. This is the 1500 metre race. Visually impaired athletes in judo competition. 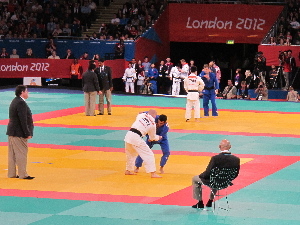 The referee aids the visually impaired judokas, positioning them holding each other at the start of the contest, informing them if they are near the edge of the mat, and stopping them and restarting the contest if they stray off the mat onto the green area surrounding it. The different areas have different textures as well as different colours. There are two mats in the arena and two matches proceed at once. The nearer pair are Takaaki Hirai of Japan with Ramin Ibrhimov of Azerbaijan. Paralympics sitting volleyball, ExCel. 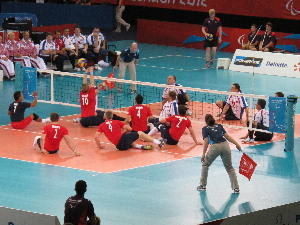 This is the first match of sitting volleyball, between Team GB and the Russian Federation - Russia won in straight sets. 50M backstroke classification S5 men at the start. Swimmers in this classification have full use of their arms and hands but no trunk or leg muscles, or have a coordination problem. 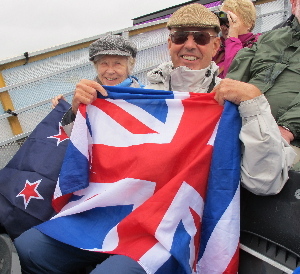 David and Barbara Hawgood watching paralympics rowing at Eton Dorney. Barbara with a New Zealand flag, David with a Union Jack. It had just been raining when we got another spectator to take the photo, so we are wearing hats and jackets.